Well, that was an eventful round 1, I wonder how the rest of this tournament will go! 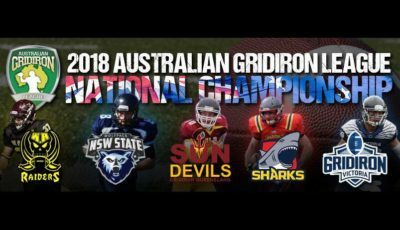 This week, the defending AGL Champions Queensland Sun Devils will make their return to competition, hosting the Victorian Eagles; whilst the NSW Wolfpack will travel south to Port Adelaide and take on the South Australian Sharks. 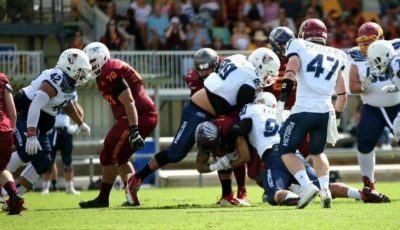 The Western Australian Raiders will enjoy the week off after their win last away from home last week. Both teams suffered defeats in their last matches so there’ll be a lot of heart in this one. The Wolfpack went down in the dying minutes to the Raiders by 2 points so they will surely be looking to get some more points on the board early and not allow the same mistakes to occur like last week. HC Jason Ray has made some minor changes to his starting team, particularly rotating his starting defensive front. This could be due to mistakes made in the previous match with the Raiders, or just to give some fresh legs a start. Whatever the choice is, the Wolfpack will need to tidy up some issues on all sides of the ball. One of the biggest problems for the boys in blue last week was their discipline. They were penalized for silly things, and whilst I don’t agree with most of the calls that the ref made, this cost NSW major yards. Meanwhile, SA will look to enjoy their first home game of the AGL campaign in front of their family and friends and turn around a major defeat last week to the Eagles. The biggest problem the Sharks faced was the Eagles strong run game, but they also made mistakes in missing plenty of tackles. HC Drew Akin will have certainly kicked the asses of his team to ensure silly mistakes like this don’t happen again. Last time these two teams met, the Sharks humbled the Wolfpack in front of their home crowd in the final game of the 2016 AGL campaign. Will the Wolfpack get payback in enemy territory or will the Sharks maul the NSW boys and defend their turf? As much as I’m a New South Welshman and the Wolfpack are my boys, this is GUARANTEED to be the match of the campaign. 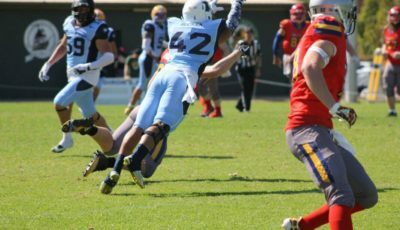 The Eagles made a triumphant return to AGL competition last week, thumping the Sharks at home. Much of their success came from a strong run game, particularly from talisman RB (and probably my new favourite player from Vic) Luke Jackson. 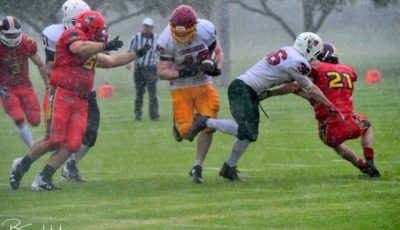 A veteran Monash Warrior, and a former Australian Outback Rep, Jackson is a power back who can run straight through the tackles and shove the football down the defense’s throats. Picking up 4 TDs last week, his success came from off tackle, draw and counter runs; but he also used his speed and power to explode through tackles and break through the SA defense. He will definitely be a player to watch this week. 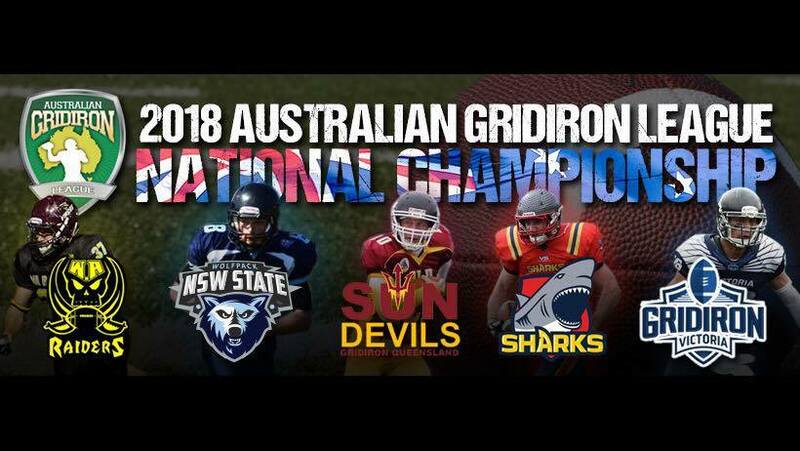 Meanwhile 1800kms away, the QLD Sun Devils have been patiently preparing to defend their title in this year’s campaign. New HC (and absolute top bloke) John “Hollywood” Roe has kept his squad details under wraps, but rumours floating around the QLD camp have said that many of the veteran players from the last AGL campaign have moved on and their places have been taken by the young bucks of the GQ. I’ll be very interested to see who makes the cut and which veteran players have stepped down and how the young bucks fare against a very well drilled and hungry Victorian squad. This one is guaranteed to have fireworks and definitely shouldn’t be missed!